Ideal for retail and warehouse applications, this Q-Connect Cutter is designed for light duty use. The 9mm blade is easily accessed through the slide mechanism and the knife features a locking device for safe use. 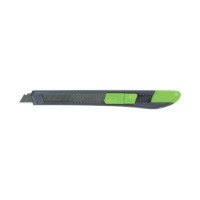 The split tail design allows for easy blade replacement when required.